I’m not in this one – but it is a great picture! 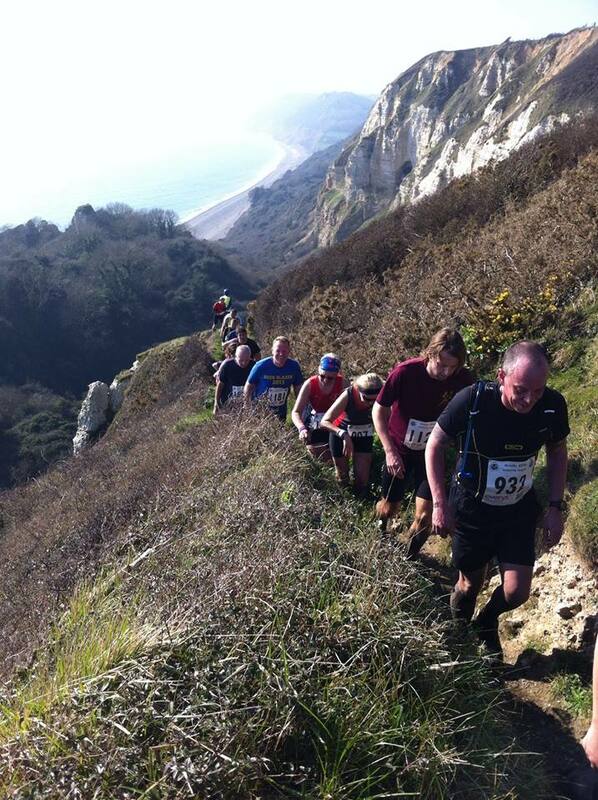 Lesley Pymm reports: For those who know me, you will know that the Grizzly (20 ish miles of beach, cliff and bog in Seaton, east Devon) is my favourite event of the year. You can imagine how I felt as I sat around in A & E on 12 February with a fractured jaw and very painful, but not broken, arm. Not happy at all. When I went back to the hospital the following Monday I asked the question: ‘When can I run again?’ I was told to leave it for at least 2 weeks and see how it went – I was free to run if I could stand any pain. So, two weeks later I did a very short walk/jog session and it didn’t hurt – much. I kept going to spin classes and then got to parkrun and ‘power walked’ the course. I also power walked the Centurion 5 miles as the beginning of March. Then I ran, well jogged, 4 miles on the Wednesday before the event and it didn’t really hurt. I knew it would be madness to do the full Grizzly having not really run for 4 weeks and nursing a not quite healed jaw – but the 9 mile cub run was on the cards!!! I turned up at race HQ and changed my number to the cub number. I asked if it was OK if I walk/ran the cub as there would be plenty of time to finish. The woman gave me a very withering look and told me it was a running race. I decided to run as much as I could and then, if I had to walk – so be it. The day was glorious. Wall to wall sunshine – what a perfect day to be doing the Griz, probably just as well I had changed numbers! Off I went with the rest of the 2,500 or so entrants in both races. From a very slow walking start we gradually made our way onto the stoney beach and there was this noise as all the runners crunched their way along the beach for about 1/4 mile. As we came off and ran through the Axe Valley Yacht Club a man turned to me and commented on how quiet it was now! Along the Esplanade and then uphill towards Beer. There was a landslip a couple of years ago, so we have to go a longer way round on road to get around it – this was the worst bit for me. It was particularly worrying when we were going up a steep hill and I was behind a few large men who were pumping away with their arms – their arms were just in front of my face, so I had to make sure we did not make contact. Through Beer, then out through the caravan site (piper was playing as usual) and at last we were off road and it was softer underfoot – but brilliant conditions. A bit of a climb then it was down a fairly steep path that is usually muddy – not too bad this year. The marshall advised us that we didn’t want to turn off on the path to our right as that went to the Brewery – oh yes, we did! On we went and then over some more grassland and the steep downhill to Branscombe Mouth. This was where the two races split. For me it was over 1/2 way and I still felt so fresh. I was back onto stones on the beach for another 1/2 mile or so, passing parts of boats that had been damaged by the recent storms, then there was the climb to the stairway to Heaven. I was still running and managed to carry on running as I went up the cliff side until nearly at the top where there are steps and walking was much easier. Reaching the top, there is a bit of a run along the cliff edge and the finish comes into sight. Still a few miles away, but you can see it! Back through Beer and another climb up to the coast path – as we are thinned out a bit by this stage we don’t have to keep to the road. The final section was through a new permissive path that has been opened since last year and was much better than the road alternative. Then it was a steep downhill roadfinish. I did have to take it easy here as it was jarring my jaw a bit, so people passed who I would normally have tried to beat. I did it though. Mike had not expected me back so soon and had just ordered a cake and coffee in the cafe as I ran past. He had to shout that he’d be back in 5! I was pleased to be able to do it and pleased that I felt so good at the end. Obviously I would rather have run the Grizzly, but this was a good test! Well done, Lesley! 🙂 Sounds like an amazing event and you did really well, especially after dealing with those injuries.